Hey, FanBros! Mellow Marketer here with first time contributor Everett Christen to the site! Hopefully, we’ll be hearing more from him in the near future. Being a part of Mutant Leadership turns people into villains in X-Men comics 100% of the time. This is hardly surprising, every other character in the X-Franchise can be written as identifiable to the audience (read: White). However, leadership figures bear the burden of advancing the Mutant Metaphor: the narrative use of mutants as a stand in for minority groups in the real world. This means that only Mutant Leadership figures need to actually function as the minority they represent. The activism required to fight for the rights of minorities is coded, direct action is viewed as unacceptable to the white moderate. 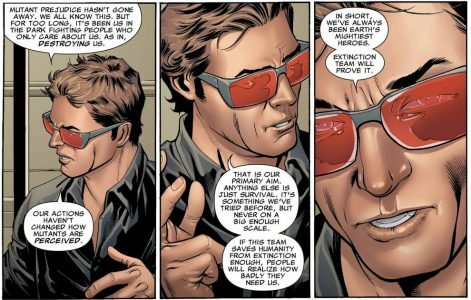 As soon as Scott Summers, Cyclops, became the singular leader of mutantkind, he became that activist. Then the writers chose to villainize him, rip him apart, then kill him off entirely because they cannot imagine a world where both sides aren’t ‘just as bad’, the other side being PoC, LGBTQ, disabled people, and any other minorities fighting for their rights to be treated like people. Barring the destruction of society, we are going to get X-Men movies forever. Fox will keep going back to the comics for new plots for films/reboots and there isn’t an American teen who doesn’t know what the X-Men are because they’ve been a multi-million dollar film franchise for 17 years. But, when you take the leader of your team and turn them into an outspoken voice against oppression, care needs to be taken with the treatment of fictional depictions of activism. Because constant false equivalence between the actions of the oppressors and those resisting oppression only serves White Supremacy. Narratively, the choice to villainize characters in positions of power is an easy one, causing A-List super heroes who have never “gone heel” or had an evil clone, etc. Cyclops was no exception(Mind Control), but it never damaged his long term credibility before. What changed? 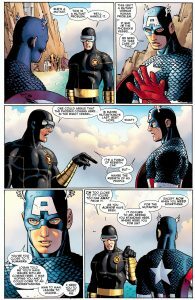 Scott had already been the activist leader of all Mutants well before it began to be asked ‘has Cyclops gone too far?’. Since Decimation, where the remaining number of mutants was reduced to 200, a bus-load of kids were killed, and mutants were literally concentrated, Scott had been in the driver’s seat for all of mutantkind. From 2005 to 2011 was unopposed (and opposite Logan). But, from 2012 until 2016, Scott was the ‘Actually Doing Something’ President of Mutants. He spent his tenure fighting for reproductive rights, fighting for autonomy, fighting against bigotry, and fighting for survival. The more he actually did, it seemed as if the writers would ask if it was too much. The closer and closer the narrative leaned on the “mutants as a minority” metaphor, the less and less acceptable “use of force” became an acceptable solution for both characters and readers when handling such a real/difficult subject. Each time a threat to the liberty or survival of mutants raised its head, Scott defeated it and the writers shifted him toward the same kinds of pitfalls in leadership that Charles Xavier made. They made him more revolutionary than Charles had ever been, had him call out systemic oppression, explore sovereignty, try to save the entire world multiple times, and somehow get the kids to bed on time too. Cyclops changed the way the world interacted with mutants through direct action. Each time he achieved a victory, through allegorical conflict(Phoenix Five), through peaceful protest(Revolution), or simply through leadership(Dark Reign), the writing would vilify him and cause him to lose personal or moral ground. 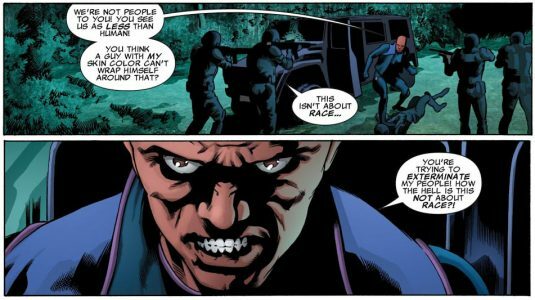 The better represented the minority metaphor became the more likely that same equivocation that cost Charles the mandate of leadership was used to taint and degrade Scott’s position until it ultimately killed him and saw his name as a dead man dragged through the mud by the Inhumans. Generations of people will grow up on these stories. If there is a fundamental problem in how activist leadership is depicted it must be addressed. If there is something wrong with the way writers interact with the Mutant Metaphor: it must be addressed. Mutants are an allegory for the oppressed. The demand for change and the willingness to take direct action to advocate for oppressed people should not be linked inextricably to a degradation of personal morals or necessitate vilification. Charles was a victim of that. Scott was a victim of that. Emma is becoming the victim of that right now. It must be demanded that the writing and editorial staff do better moving forward and adaptations steer clear of these pitfalls. Civil rights leaders, even entirely fictional ones, aren’t there only to be martyrs contrary to popular opinion. Let us know what you think, FanBros. Are there other characters you’ve felt have fallen into this trap? Comment below or at @FanBrosShow!